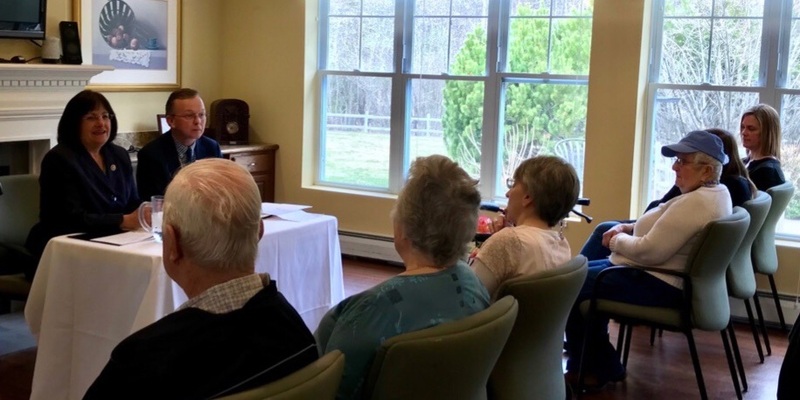 On Friday, I visited The Birches at Concord to meet with residents and caregivers and discuss the challenges associated with caring for people suffering from Alzheimer’s. More than 20,000 Granite Staters suffer from Alzheimer’s, and that number is expected to grow by as much as 37% by 2025. I was a caregiver for my late mother, who suffered from Alzheimer’s and passed away in 2005, and I know firsthand the toll the disease takes not only on the patients, but on their friends and loved ones. That’s why I’m working to advance legislative proposals to improve outcomes for people with the disease. I am a cosponsor of the BOLD Infrastructure for Alzheimer’s Act, which would enable public health officials to promote prevention, early detection and diagnosis and to collect data, as well as the Concentrating on High-Value Alzheimer’s Needs to Get to an End (CHANGE) Act, which would direct the Centers for Medicare and Medicaid Services (CMS) to identify tools that will incentivize clinicians to detect, refer and diagnose Alzheimer’s and related dementias in their earliest stages. I will continue working with my colleagues to advocate for robust funding for medical research and to increase support to Alzheimer’s patients and those who care for them. Read my op-ed in the Concord Monitor about the need for federal funding for Alzheimer’s HERE. As the first Representative from New Hampshire to serve on the House Agriculture Committee in decades, I’ve seen firsthand how, when we work together across party lines, we can enact policies that benefit family farms and rural communities in New Hampshire and across the country. That’s why I was so disappointed by Committee Chairman Conaway’s decision to move forward with a partisan Farm Bill. Historically, this legislation is bipartisan, but the proposals being advanced by Chairman Conaway simply go too far. The Republican-drafted bill would slash hundreds of millions of dollars in mandatory funding for conservation programs, roll back critical protections from harmful pesticides and lead to thousands of Granite State families losing nutrition assistance. This bill cuts over $23 billion in benefits to the Supplemental Nutrition Assistance Program (SNAP), which supports nearly 92,000 food insecure people in New Hampshire. I remain ready to work across the aisle as soon as my Republican colleagues are ready to push partisanship aside to do right by families across the country. Watch my remarks at the Agriculture Committee Meeting on the Farm Bill here. Last week, the Supreme Court heard oral arguments in South Dakota v. Wayfair, a case which has serious implications for taxation in New Hampshire. I urge the Court to rule in opposition to South Dakota and prevent the implementation of an online sales tax. This tax would be a serious burden on small businesses in New Hampshire, subjecting them to more than 9,000 taxing jurisdictions across the country. The Court should preserve the precedent that would prohibit states from collecting sales tax on companies that do not have a physical presence within that state. Companies in the Granite State should not be in the business of collecting sales tax for South Dakota or any other state. I’ll continue to fight any effort, legislative or through the courts, to impose an online sales tax on New Hampshire businesses. I encourage you to reach out to me with any questions, concerns or ideas you may have. You can call my Concord office at 603-226-1002 or my Washington, DC office at 202-225-5206. Thank you for all you do to make New Hampshire such a great place to live, work, and raise a family. Enjoy your week!